115 Complete Entertainment Packages & Acts, with or without Santa! childrens parties, festivals & special occasions. Simply choose a package which matches your requirements and budget. Packages range in price from $400 - $5,291. Most companies spend approximately $1,500 - $3,000 and receive a wonderful fun-filled day of entertainment. It is much cheaper to book a complete package, because most of our shows & services are significantly discounted when part of a package. There is no additional cost for GST. Travelling expenses apply for out of town gigs. For Christmas Parties you have the option of Santa (and Ms Mary Christmas) arriving on top of the spectacular chookmobile, with all packages...at NO EXTRA COST!!! Santa even has a microphone (with speaker on the bonnet of the car.) All you need to do is organise a driver for the 100 metre entry. Our selection of packages will ensure a wonderful day of entertainment, fun and audience participation. PLEASE CLICK HERE FOR PACKAGES costing between $400 - $5,291, which include SANTA. PLEASE CLICK HERE FOR PACKAGES without SANTA, from $400 - $5,000. The Spunky Monkey Cookery Show & Rudi Trudy Rooster Show are both popular shows performed by Don Murchison, a seasoned entertainer who has toured these shows on stage from town halls to shopping centres throughout Australia & New Zealand. Both shows are 30 minutes in length. Ozzo Clown Circus and the Punch & Judy Show are performed by Frank Ozzo, who is well known for performing in schools & shopping centres throughout Australia. Both shows are 30 minutes in length. Steve Panozzo is our renowned carricaturist. He has won many awards & is popular on the Corporate circuit. His inclusion will keep adults as well as children fascinated. Steve sketches for 3 hours, with each of his subjects receiving their own unique portrait. If Steve is already booked, he is ably backed up by Tony Kentuct, another excellent cartoonist. The Great Cardini is still chugging along after decades of work entertaining audiences with his magic tricks in Australia & New Zealand. In our packages he performs one hour of strolling Card magic. 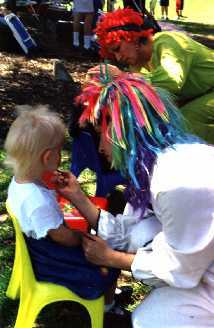 Face Painting is usually with Bronwyn Fullerton, who is an experienced actress, used to dealing with children. 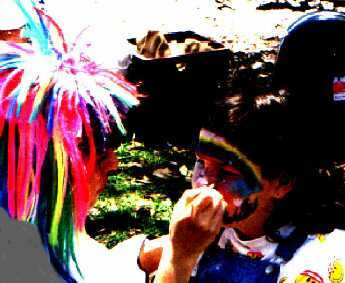 Two face painters can be organised for larger functions. Bronwyn sometimes doubles as Mary Christmas. Our balloonologist can be one of several performers who is available at the time. She creates animals & shapes from balloons she hands out to the children. She sometimes doubles as Mary Christmas. Santa [alias Don Murchison] concludes the entertainment & needs no introduction. He usually arrives on top of the Chookmobile, for a grand entry. This requires a volunteer to drive the Chookmobile a few hundred metres to the party area. Santa sings, plays the guitar, has children sitting on his knee & of course gives out the supplied presents, with ample photo opportunities all around. As an alternative to a Picnic, we can organise a PIRATE THEME PARTY on board the 'SEA MESSENGER' or another larger boat, on Sydney Harbour. A highlight of the Pirate Theme Parties is the Treasure Hunt at Greenwich Point! Please check with us for current prices. This page was last amended 22.10.2011.